The traditional design and luxurious comfort of the Stressless Consul (S) are both stately and refined. After a long day, you’ll instantly relax as the plush cushions embrace your body for full support. Built-in, innovative technology supports the lumbar region of your back and neck to guard your long-term health and well-being. The patented Glide system adjusts internally as you move for personalized support where you need it most. Its sturdy wooden base can be customized to your personal preference for staining in various colors. Adjust your view in a room with ease thanks to the 360 swivel base. Smooth leather, padded armrests, and a high back offer comfort like no other. Relax your full body with the matching ottoman to support your legs and feet. The Consul (S) is well suited for individuals of smaller size and stature. Innovative Glide technology adjusts support based on your body’s movement. You receive personalized support every time. Striking wood accents and simple lines make this chair both classy and elegant. A 360 swivel moves with you to adjust your position or view. With rich Scandinavian design and built-in innovation, the Consul (S) is a beautiful addition to your home offering luxurious comfort for many years. You’ll love the luxurious feeling of the smooth leather and plush cushions of the Consul (S). The classy wood accents dress up this traditional chair offering an elegant and stately appeal. Need a bigger size? 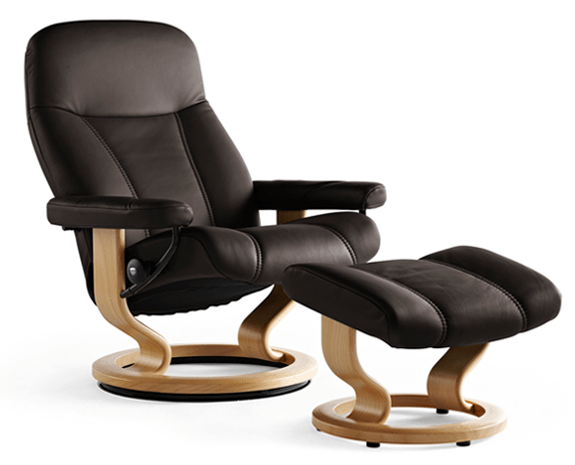 Check out the Stressless Consul (M) or Consul (L). We ship to any address in all 50 United States. Ask for details regarding shipments to Canada. For quality assurance, all Consul (S) shipments must be insured for accident, loss, or damage. Once your shipment leaves our facility, a tracking number is provided via email. Unless otherwise stated, delivery means “to your door”. Shipments must be signed for by someone over 18 years of age.